There are so many items in a house that require regular maintenance. As homeowners, we often ignore maintenance on items that are working properly. Why spend money on a problem that doesn’t exist? If your garage door opener is working, why would you have it tuned up? Just like your car regular scheduled maintenance is essential. Not only for the longevity of a system but for safety as well. You could be preventing a potentially life-threatening problem. In this case, we are talking about avoiding a preventable house fire. Each year there are an average of 15,970 house fires attributed to clothes washers and dryers. * Of those, 92% were started by the clothes dryer. The single largest problem was lint and dust that ignited due to improper cleaning. 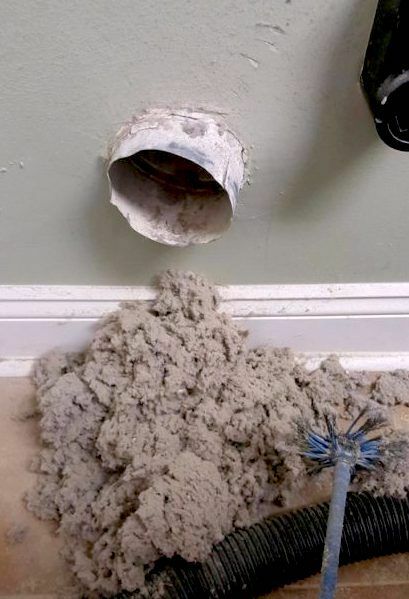 The dryer flue that expels the waste air from your dryer contains a lot of lint. The dampness of the exhaust causes the lint to stick to the sides of the flue causing a restricted flow of air. Over time, this can cause your dryer to over-heat and set the lint on fire. Even if you installed a brand new clothes dryer, built-up lint from years of use could restrict the flow of air. The good news is that a dryer fire is very preventable. There are companies that specialize in this service for a reasonable fee, or you can buy a kit at your favorite hardware store to do it yourself. The frequency with which you have your dryer flue cleaned depends on several factors; How often you dry laundry, how long your flue is, and the diameter of the flue. If your clothes dryer is taking a long time to dry your clothes or doesn’t dry your clothes thoroughly on the first load, your dryer flue likely requires cleaning. You will be amazed at the quantity of lint that has built up. And the best part is that your dryer will work better, faster and cost you less money to run!